Wisconsin-based, family-owned and operated musical display business strengthens marketing push with help from The BLÜ Group - Advertising & Marketing. This magazine represents the best of the best and that’s what String Swing is all about. High-quality, American-made products, created by people that love what they do. String Swing, Ontario, WI, is promoting its love for music and dedication to creating high-quality musical instrument displays with a new ad to be featured in M Music & Musicians Magazine. The campaign, created and developed by The BLÜ Group – Advertising & Marketing, emphasizes the musicians’ and retailers’ desire to do more than just hang their instruments…they want to display them. And when it comes to displaying these musical works of art, nothing beats an authentic String Swing. Celebrating its 25th Anniversary, the original String Swing (CC01) has satisfied millions of music enthusiasts around the world. Its low-profile design is attractive and cradles guitars comfortably and securely. The CC01K is an updated version of the original String Swing. Its narrow fit, deep cradle design ensures perfect placement of instruments in between sessions. 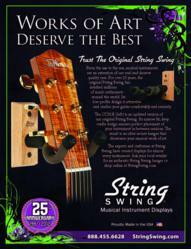 The original String Swing and other String Swing branded products can be found at retailers around the globe. Online ordering is available at StringSwing.com. About String Swing: Family-owned and operated since 1987, String Swing has been satisfying the musical display and hanger needs of retailers and musicians worldwide. Their high-quality, competitively-priced products are American made and structurally guaranteed for life.